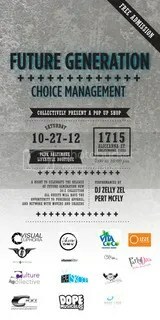 Choice Management is hosting a ‘Future Generation’ event October 27th. The Scene DMV will be there to cover the event. Check back for photos and more. Tags: brand, choice management, DMV, entertainment, music. Bookmark the permalink.